House of the Day: Ewwww or Ahhhh? Sometimes, beauty is simply in the eye of the beholder. 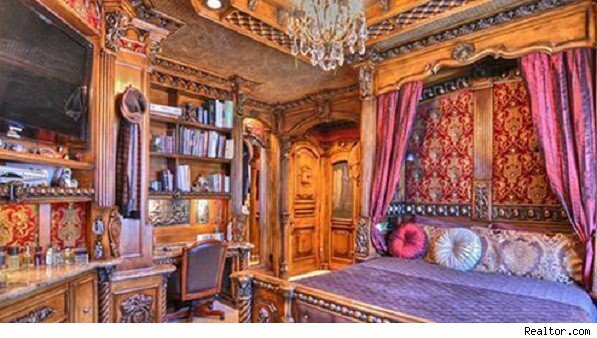 We leave it to you, readers, to decide whether this Huntington Beach, Calif., place is over-the-top ornate or worth every shiny nickel of the $2.15 million the owner is asking. The 411: It's a 4,025-square-foot Mediterranean in a gated community within walking distance of the beach in "Surf City USA." Built in 2001, it has four bedrooms and pretty much every inch has custom wood carvings, custom-made tiles, Venetian plaster, coffered ceilings, stained glass, granite. Is It Great or Too Ornate? There are four fireplaces, all with custom-made mantles. It has hand-crafted doors, wrought iron banisters, restaurant-quality kitchen appliances. Every bedroom has custom closets with stained woods. The master suite has a steam room, fireplace, balcony -- there are 600 square feet of balconies and patios. The home has two wine cellars, including one underground that looks into the glass see-through to the rock pool with a grotto. The home is listed with David MacLeod of Century 21 Beachside Realtors. And more Houses of the Day and other homes for sale in Huntington Beach, Calif., on AOL Real Estate.